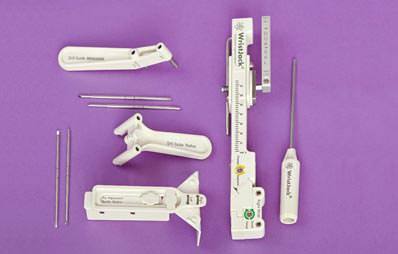 The WristJack Fracture Reduction System was created around the mechanics of the distal radius fracture in order to help physicians obtain the best possible result for their patients. The WristJack uses gear driven adjustments to take advantage of functionally intact soft tissue hinges to achieve ligamentotaxis in multiple planes, or MULTIPLANAR™ Ligamentotaxis. 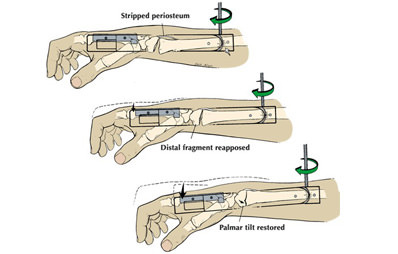 Palmar translation of the hand on the forearm tightens an intact dorsal periosteum and restores palmar tilt. Radial length, rotational alignment and radial inclination are all independently adjustable using color-coded gears. Wrist positioning is independent from fracture reduction. 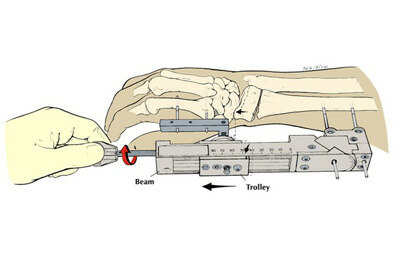 Fracture Reduction using the WristJack can be monitored with fluoroscopy. Step by step fracture reduction using incrementally adjustable, color-coded gears. RADIAL LENGTH is restored using the RED adjustment. With the wrist in neutral, length is restored to the distal radius. PALMAR TILT is controlled with the GREEN adjustment. 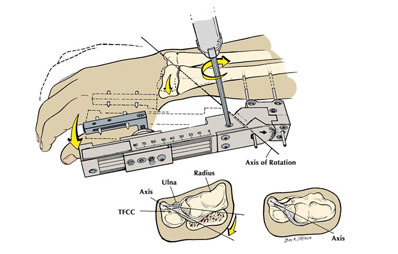 Clockwise rotation translates the hand palmarly, aligning the fragment(s) as the periosteum is reapposed. Additional translation of the hand rotates the distal fragment(s) and tilts the articular surface palmarly. ROTATIONAL ALIGNMENT is controlled with the YELLOW adjustment. If a deficit in passive forearm rotation or x-ray evidence of malrotation is present, use of this adjustment rotates the distal fragment into either pronation or supination. 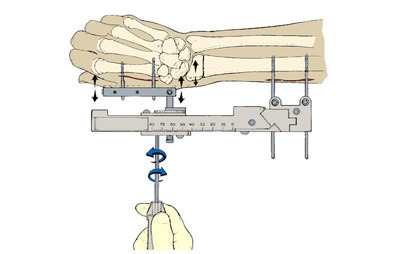 RADIAL/ULNAR fracture alignment is controlled using the BLUE adjustment. Use of this adjustment “fine-tunes” radial/ulnar alignment. This is important when the fracture extends into the distal radial-ulnar joint. 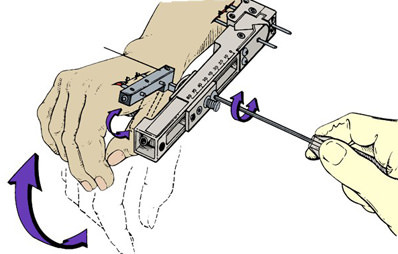 WRIST POSITION is selected by using the PURPLE wrist lock screw. The wrist can be placed into extension following fracture reduction. Wrist extended position helps avoid finger stiffness and carpal tunnel syndrome. In order to help ensure the best outcome possible when using the WristJack, it is important for physicians to discuss with their patients why this course of treatment was chosen, the surgical procedure, the length of treatment and any potential complications. The WristJack remanufacturing program can substantially reduce costs. Following use, return the WristJack and instruments to Hand Biomechanics Lab. The complete remanufacture of the device involves disassembly, cleaning, parts replacement, reassembly and testing to the same standards as a new WristJack. The device, instruments, new fixation pins and instructions are repackaged and returned to you. By taking part in the program, you can reduce costs by as much as 40 percent, while still maintaining the excellent product quality you have come to expect from Hand Biomechanics Lab.